Born in 1991 in Omsk. He graduated the Yankelevich Children's School of Arts and Shabalin Omsk Music School (Class of Honoured Artist of Russia Alexander Muralev). He received a Bachelor's Degree in the Russian Gnessin Academy of Music (class of Alexander Dogadaev). He currently continues Master Studies at the Russian Gnessin Academy of Music in the same teacher class. 2013 - the winner of the International Competition "Vocation - Musician" (Moscow) and International Competition of Performing Musicians (Great Britain). 2014 - the winner of International Festival Competition «Musica Classica» (Ruza) and International Competition «Art Music» (Moscow). 2015 - laureate of the II Prize at the Open Contest of Young Performers "Concert with Orchestra" (Voronezh). 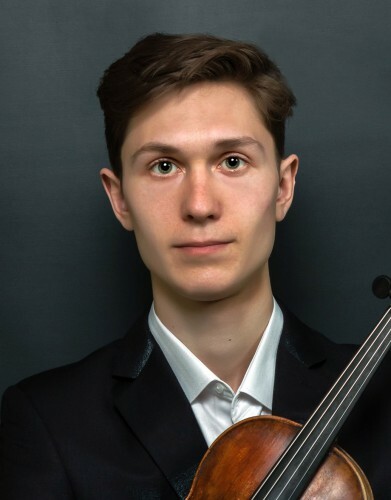 2016 - the winner of the International Competition for Young Musicians «Rizzardo Bino» (Italy) and Competition «Ohrid Pearl» (Macedonia), Winner of EMCY Special Prize. 2016 - laureate of the I prize at the III International Zagir Ismagilov Competition of musicians-performers (Ufa). He participated in master-classes with Alexander Shustin, Pavel Vernikov, Evgeniya Chugaevа, Michael Kugel, Anna Kandinskaya. Participant of programs of the St. Petersburg Music House since 2016.